A man seen as so insignificant he once languished unnoticed in the King County Jail for months has now been mostly ignored in death. Two years into a self-declared homelessness emergency, shouldn’t we be better than this? So overlooked was Darrell Williams in life that he once was simply forgotten in the King County Jail, spending 95 days locked up even though he had been ordered released after only a few hours. 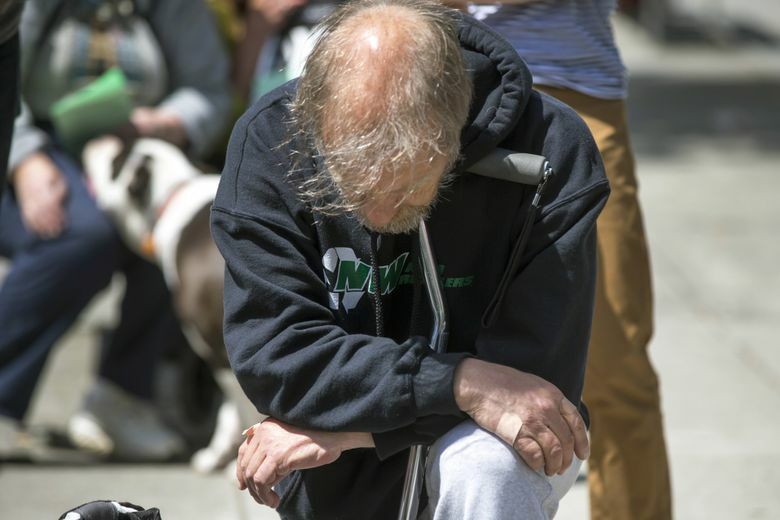 His death last month on the streets of Seattle similarly made no ripples. There was no mention of it in the media, though he was found dead on Interstate 5 under the downtown convention center. Williams died Sept. 9 near an unsanctioned encampment tucked up under the freeway. The State Patrol believes he could have jumped, but nobody saw it and so nobody really knows. One group did mark the end of his 49-year life, the Homeless Remembrance Project. The Medical Examiner’s Office notifies this group whenever street folks die, and they hold memorial services outside the city court downtown. Williams is one of 65 homeless people found dead outside in King County so far this year. At least 12 died violently. Seven were murdered, and five died from suicide. Williams is not yet included in either figure. “It’s a heartbreaking indicator of the homeless crisis,” the group says. What struck me about Williams’ life and death is how anonymous it was. He was featured in the news a decade ago when King County blamed a “paperwork glitch” for completely forgetting that he was in jail for three months. He had been picked up for urinating in public and supposedly obstructing an officer. When he wasn’t charged, he was ordered released the next day. Nobody told him. So he was simply kept there — like something you’d expect from “a Third World country,” a defense attorney said. “Not charged, transient spends 3 months in jail — forgotten,” read a 2008 headline in the Seattle Post-Intelligencer. His death went just as unnoticed. Imagine if you or I were found dead next to the convention center. Probably there would be some mention somewhere, no? Expanding out from Williams, the 64 other outdoor deaths likewise have attracted little notice, or caused much of any change in the debate. After two years of a declared homelessness emergency, city officials still can’t agree whether the homeless should be allowed to sleep out under bridges and in the greenbelts of parks. In the next few weeks there is going to be yet another fight at the Seattle City Council over whether the city should let people stay in these scattered encampments like the one near where Williams’ body was found. Or whether the city can periodically remove them. One side, led by Councilmembers Kshama Sawant and Mike O’ Brien, has introduced budget language that would bar the city from interfering with unsanctioned encampments on many public lands. Their main argument, echoed by mayoral candidate Cary Moon, is there isn’t always enough shelter and so it’s counterproductive to move, or sweep, campers. The other side, which includes current Mayor Tim Burgess and mayoral candidate Jenny Durkan, says it’s immoral to have people living in greenbelts and under bridges. By allowing camping, the city also forfeits what’s left of its tenuous control of the situation. I agree with this latter view. Portland tried legalizing camping in some areas and homeless camps exploded, so it had to backtrack. But more important are those 65 deaths. They are a brutal indictment of the Seattle status quo — or would be, if we noticed them. To the city’s credit it has opened six sanctioned encampments. Number of violent deaths in those so far? Zero. So do more of that. Regardless of which view prevails, it’s damning that after two years of emergency the city still hasn’t resolved this most basic question of what strategy to pursue. Allow unsanctioned camping, or not? They can’t make up their minds. There are no easy answers in homelessness, but we should be better than this. Darrell Williams went unnoticed in life and death, but he’s not that unusual. Four more homeless people have been found dead outside since Williams. Average age: 45. The emergency rolls on, whether we come together to do something about it or not.